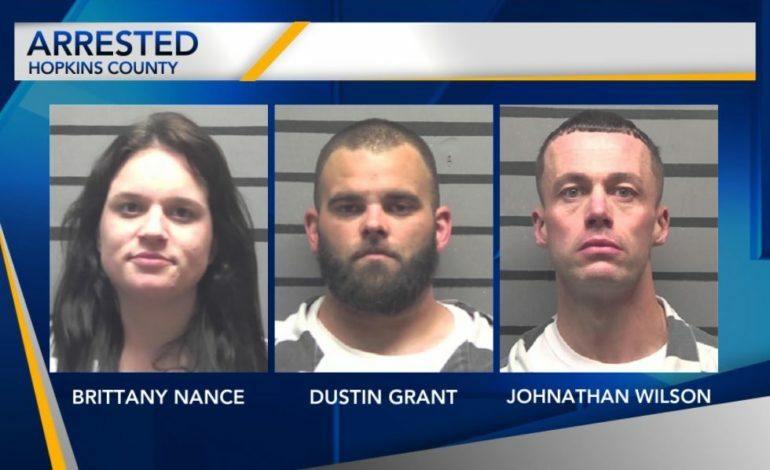 Three people have been arrested in Madisonville Tuesday following a drug trafficking bust. Detectives with Kentucky State Police DE/SI West and the Madisonville-Hopkins County VICE/Narcotic Unit executed a search warrant at Days Inn in Madisonville after receiving a tip on 40-year-old Johnathan Wilson and 28-year-old Dustin Grant. While searching the room, detectives located contraband and illegal items. Detectives also located a large amount of crystal methamphetamine and a set of digital scales inside a toilet in one of the drains causing the other items to become clogged inside the toilet. Several empty plastic baggies, a large amount of money, and other drug paraphernalia were recovered from the scene. Wilson and Grant were arrested on drug trafficking charges, possession of drug paraphernalia, and tampering with physical evidence. Wilson was also arrested on a number of active warrants for fleeing and evading police and failure to appear. Grant was also arrested on one active warrant. Brittany Nance, 29, and Autumn Shelton, 20, were present during the bust and were also arrested and charged. Nance was charged with hindering prosecution or apprehension while Shelton was charged with possession of a controlled substance and possession of drug paraphernalia. Shelton was cited and released.